Don't miss 3D tour click under photo. 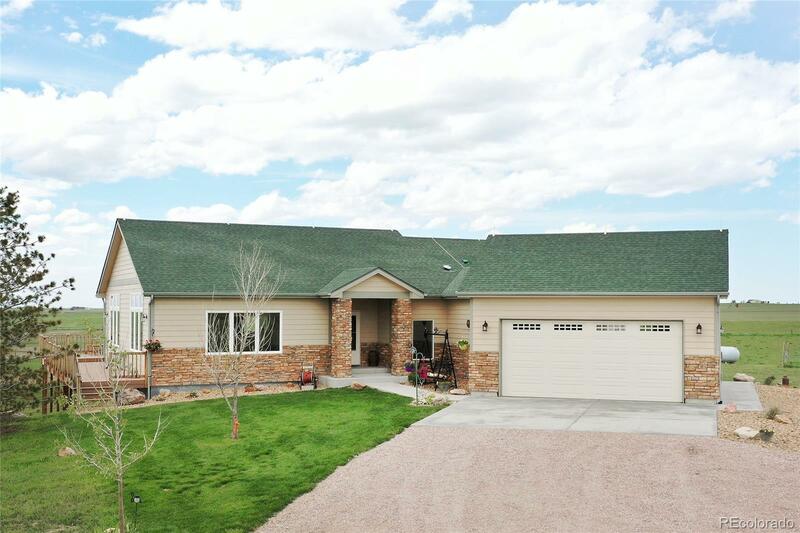 Tasteful custom ranch plan home built in 2012 and immaculately maintained by original owner. Views of the entire Front Range. Full walk-out with pellet stove and rustic fence board siding in great room. Lots of sun and open great room floor plan with custom hickory cabinets all soft-close, stainless appliances, electric cooktop/range (gas stub exists) and granite counters. Wrap around Trex deck for entertaining. Hardwood floor and custom tile throughout. Master bath has radiant floor heat. Landscaped and seeded for hay in 2014. (If interested seller can provide names to bale hay). Huge 30 x 65' finished shop with concrete floor, electrical and plumbed for sink. Fenced and cross fenced for livestock with built in shed for horses off shop. Antique corn planter @ entry and manure wagon near home included.